Our beleaguered and religion-soaked cousins south of the border may, from time to time, look northward with envy at Canada’s largely non-religious civil society. Our politics are not replete with the same invocations to the intercession of the supernatural that plague the American landscape; indeed, it is considered somewhat gauche in most circles to make large public shows of one’s private belief. Canada’s approach to religion is largely a ‘live and let live’ one, with the exception of certain rural areas where religious affiliation is held in the same grip as one’s self-identity. As I’ve discussed at various points in the past, this laissez faire approach to religion has not stopped the Republican North government of Stephen Harper from deciding that Canada’s international role should be to protect religious freedom, despite the repeated warnings of those American officials who have tried the same and realized what a mine-field it becomes. An entirely unnecessary ministry has been created in order to oversee Stephen Harper’s desperate attempt to look after the evangelical base that he needs to be re-elected, but whose actual priorities (destroying women’s health care, legislating Biblical morality) he cannot espouse for fear of triggering a centrist backlash. I thought this was a particularly sad commentary on reality for many Asian Americans, forced to pay the price for the ignorance of the violent reactionaries among their countrymen. Hari, born in New York, has Indian ancestry, which would (in an even slightly less-insane world) preclude him from being suspected for a crime – a crime whose author we don’t know. 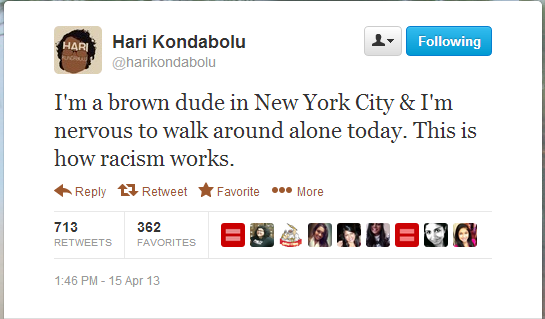 However, because those who would reflexively blame “Muslims” for pretty much everything aren’t going to spend a whole lot of time studying the history of India, or devote too many brain cells to the parsing of the likelihood of a random person with brown skin being actually connected to anything unsavoury, Hari’s caution is warranted. Rehtaeh Parsons had a goofy sense of humour and loved playing with her little sisters. She wore glasses, had long, dark hair and was a straight-A student whose favourite subject was science. On Sunday night, the 17-year-old’s family took her off life-support. Three days earlier, on Thursday night, she hanged herself in the bathroom. Anyone who reads this blog regularly knows what my position is on “intent” when it comes to things like racism and misogyny. Intent lies on an orthogonal axis to racism – someone doing something intentionally racist just adds bad intent to bad action. If we are of the opinion that racism is harmful in and of itself, we have to identify something as ‘racist’ or ‘not racist’ based on its own merits, regardless of whether the person “meant to”. This appears to be a major sticking point for people. They have bought, either consciously or unconsciously, into the myth that racism is something perpetuated by “racists”, and that if someone didn’t mean to do it then it can’t really be racist – just “ignorant” or “an accident” or whatever euphemism they prefer. This myth has a lot of popular currency and is fairly ubiquitous within North American discussions of race. The problem, of course, is that people can be and are discriminated against based on their race in ways that have nothing to do with ill intent all the time. Demanding that intent be consubstantial with racism precludes us from taking any action against these kinds of racism. I went to a high school with an incredibly diverse student body. While I didn’t really recognize it at the time, I was incredibly lucky: I was surrounded at all times by people from all over the world with a wide variety of experiences and beliefs. It didn’t “force me” to be tolerant or anything like that – like all things that happen during youth I just took it in stride. It wasn’t really until I got to the largely monochromatic environs of my undergraduate program* that I realized what it was like for major parts of the rest of the country – surrounded by people who look like you, and taking it in the same stride that I took my variety of classmate. The idea that someone would want to segregate schools is, thus, very foreign to me. My education benefitted immensely from being cheek-by-jowl with people whose backgrounds were dissimilar to my own. It broadened my world view and allowed me to reflexively challenge a lot of racist and xenophobic assumptions about people who weren’t born in Canada in a way that the classes I took couldn’t hope to approach. The idea of someone choosing to rob someone of that kind of opportunity is baffling.